It’s always refreshing when a company debuts a new campaign that isn’t cheesy, obnoxious or deceptive. Marchon Eyewear had us blown away (and searching for the nearest box of tissues) when we heard about their latest crusade to bring about positive change—Eye Make a Difference. Here’s the rundown for the campaign: Marchon selects individuals who have made a significant impact on people’s lives through charity or some other kind of organization. These people are then featured wearing Marchon brand eyewear on posters, counter cards and other marketing materials to get their name, face and cause out there for the world to see. In turn for sharing their story, Marchon makes a generous donation to the featured charities. 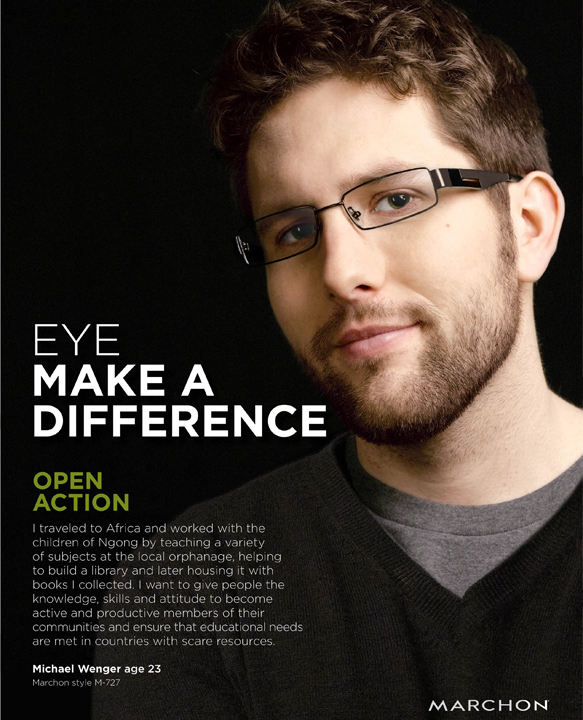 There’s also a website dedicated to Eye Make a Difference where you can find intimate videos of the current do-gooders along with an opportunity for you to share a story of someone you know who is making a difference. Marchon already has this campaign in full swing with more than worthy candidate Michael Wenger. During college, Michael received a grant to travel to Ngong, Africa where he spent his time working with children at a local orphanage. His experience inspired him to found ProjectEducate and co-found OpenAction to help people who want to make a difference find a cause more quickly and efficiently. Learn more about Michael’s inspiring journey here.